One of America’s most advanced manufacturers — San Diego genetic sequencing pioneer Illumina –opened its doors to the public on Friday to celebrate Manufacturing Day. More than 140 visitors, from high school students to biotech professionals, toured manufacturing areas on the company’s six-building campus near the Westfield UTC shopping center. The company was one of more than 50 locally that participated in the national day of recognition for American manufacturers. San Diego is home to some 4,000 manufacturing companies employing 107,000 people. “San Diego’s manufacturing industry spans several sectors critical to our regional identity, from defense and aerospace to craft brewing and sports and active lifestyle,” said Mark Cafferty, president and CEO of the San Diego Regional Economic Development Corp.
Much of Illumina’s campus in San Diego is devoted to research and development, but it also makes kits for collecting and testing DNA samples. Its iconic desktop sequencers, which start at $50,000, are made in Northern California and overseas in Singapore. Not every medical researcher can afford a sequencer, so Illumnia also offers sequencing as a service. 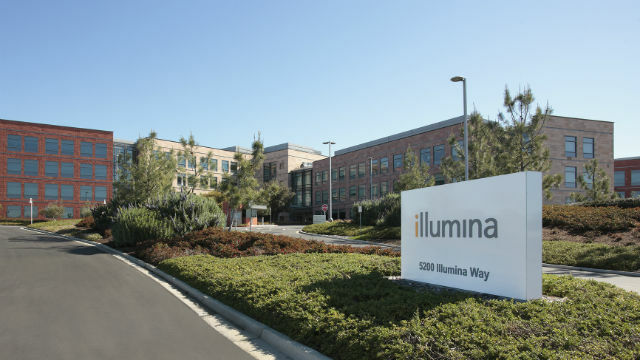 Its Illumina Clinical division operates three shifts, seven days a week, sequencing thousands of samples at a time. Posted in Business | Tagged gene sequencing, Illumina, Manufacturing Day, San Diego Regional Economic Development Corp.